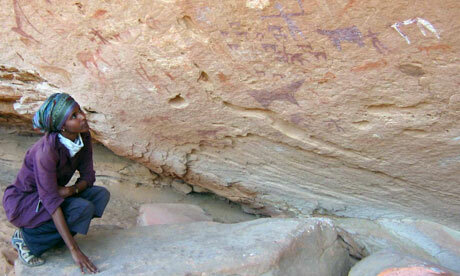 Scientist unearths 5,000-year-old rock art, including drawing of a mounted hunter, in Somaliland. Striking prehistoric rock art created up to 5,000 years ago has been discovered at almost 100 sites in Somaliland on the Gulf of Aden in eastern Africa. A local team headed by Dr Sada Mire, of the Institute of Archaeology at University College London (UCL), made the finds, which include a man on horseback, painted around 4,000 years ago – one of the earliest known depictions of a mounted hunter. Leaping antelopes, prancing giraffes and snakes poised to strike are among animals and reptiles depicted with astonishing clarity. Such is the quality of the paintings that at least 10 sites, scattered across semi-desert terrain, are likely to be given World Heritage status. Mire, who has just become a UN consultant for Somaliland, said: "These are among the best prehistoric paintings in the world. "Yet Somaliland is a country whose history is totally hidden. With wars, droughts and piracy in Somalia, hardly anyone has researched the archaeology until now. But it's absolutely full of extraordinarily well-preserved rock art." Dhambalin, about 40 miles from the Red Sea, features horned cattle, sheep and goats painted about 5,000 years ago. The animals have distinctive bands around their backs and bellies, which suggests farming or ritual traditions. The pictures also depict animals, such as giraffes, no longer found in Somaliland. Mire, who is Somali-born, has been struck by paintings of "eerie headless creatures". She said: "Sometimes the cattle are represented as necks or horns, a pictorial shorthand that was evidently sufficient to convey meaning." Other paintings are more mysterious, such as the 2,000-year-old colourful images of the full moon, half-moon and geometric signs at Dawa'aleh. Mire believes these depict the ancient artists' view of the world, time and space. Somaliland is in the northern part of Somalia, an area slightly larger than England but with a population of just 3.5m. More than half are nomads. it a breakaway state teetering on the edge of a violent region.The discovery of the 100 sites follows that of cave paintings at Laas Geel in 2000. For centuries, they were known only to nomads, who believed the site was haunted by evil spirits. Mire's research study will be published this month in Current World Archaeology.